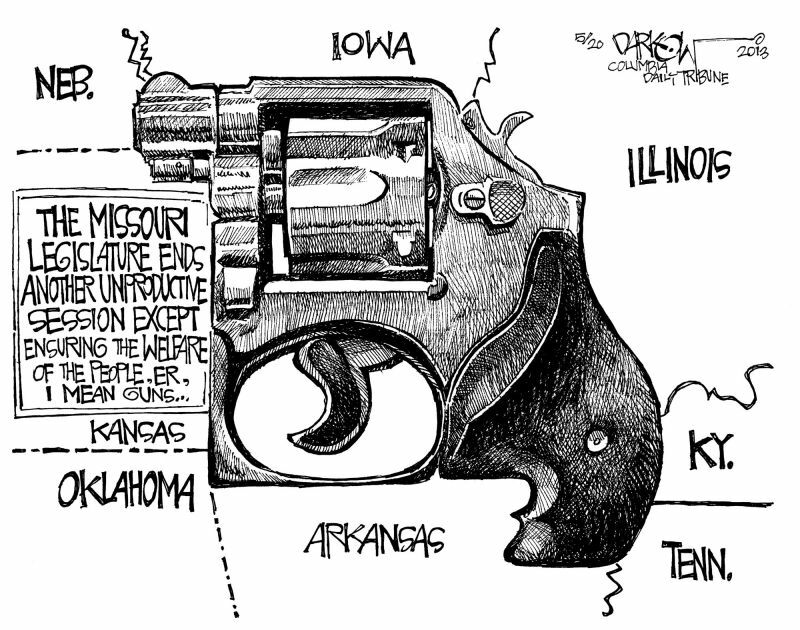 Who benefits from NRA’s push for MO guns-everywhere law? The National Rifle Association will make the override of Senate Bill 656 their top priority in the country this week as the omnibus gun bill continues to gain momentum as the most high-profile legislation at stake on Wednesday, says an article in the Missouri Times. The pro-gun group will launch a once-in-a-decade lobbying effort to override Gov. Jay Nixon’s veto of a bill that has drawn fervent support and opposition from all corners of the country. As part of their efforts, the NRA has flown in several staffers to help lobby lawmakers, launched television ads, and sent mailers to key targeted districts. Whit O’Daniel, who lobbies on behalf of the NRA, said he’s been texting the entire Republican caucus to inform them that the NRA ranks SB 656 as the biggest priority in the country. It’s also their biggest priority in Missouri since 2003. Imagine that! The NRA thinks that giving any and all Missourians unregulated rights to buy, own, sell guns and shoot their neighbors at will (as in stand-your-ground) is one of the biggest priorities in the nation. It’ll be good for NRA sponsors I suppose, as in the get-rich-quick kind of good. A former Tarkio R-1 High School student who brought a loaded semi-automatic pistol to school, causing the school to be locked down, pleaded guilty in federal court today to illegally possessing a machine gun that was found at his residence. According to court documents, Knoth – who came to school on Feb. 11, 2016, wearing military-style clothing, boots and ballistic body armor – displayed a fully loaded magazine to another student that day. That student alerted a teacher, and the school contacted the Tarkio, Mo., Police Department. School officials then discovered a loaded Glock 9mm semi-automatic pistol in Knoth’s backpack, along with four loaded 9mm pistol magazines, three loaded .223- or .556-caliber magazines, a spring-assisted knife, a seatbelt cutter and a window punch. Knoth was arrested and handcuffed. The school was placed on lockdown. Investigators searched Knoth’s vehicle, which was parked in the school parking lot. They found two loaded 9mm magazines and 15 loaded .223/.556-caliber magazines. Investigators also searched Knoth’s residence. During a search of the southwest bedroom, investigators found a loaded machine gun in the closet – an AR-style .223/.556 pistol, containing no visible serial numbers or manufacturer stamp. They found a second machine gun, an UZI-style 9mm firearm (unknown manufacture), in the dresser. Investigators also found numerous rounds of ammunition and numerous loaded .223/.556 and 9mm magazines throughout the residence. So are unstable young men with a fetish for guns and violence among the persons whose priorities the NRA is spending so much money to support? You better bet they, and their ilk will be among the beneficiaries.Of course, if the NRA gets its best-of-all-world druthers, teachers and administrators, along with each kid in Knoth’s school would all be sporting “good guy” guns in order to ward off attack. Possible outcomes? Draw your own conclusions.